THIS REVIEW OF ‘THE MAXX 100-PAGE SPECIAL’ CONTAINS SPOILERS. by Brendan Hodgdon. 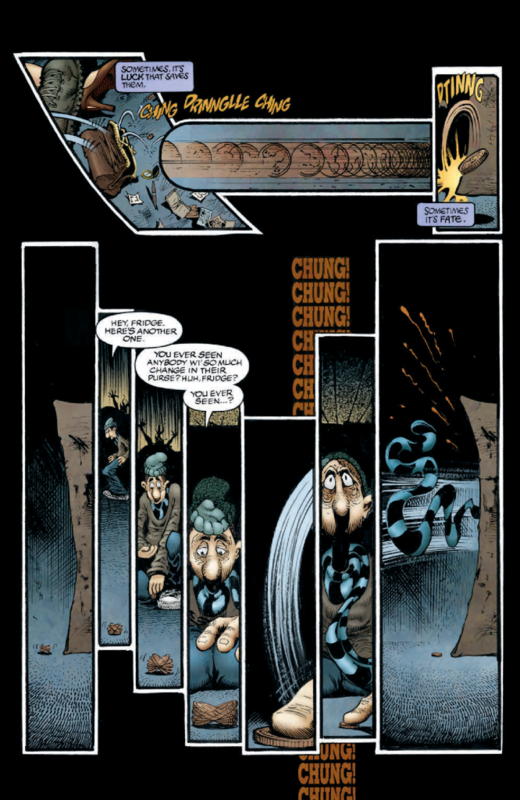 It takes a particular sort of artist to leave such a substantial impact that his work and style is instantly recognizable even to those that haven’t read his comics, and Sam Kieth is very much that sort of artist. While I’d never really read any of his work before, I already felt familiar with him thanks to the indelible impact that he had as part of the indie comics boom of the 1990s. Now for readers like myself, IDW is offering this week’s The Maxx 100-Page Special, a mini-collection ostensibly meant to be a primer for the uninitiated. The debut issue of the series, which Kieth co-wrote with William Messner-Loebs, is a solid start to both the anthology and the series. It very quickly establishes The Maxx as something of a deconstruction of many of its 90s contemporaries. Kieth makes at least as much of an impression in his layouts and the way he designs a page as he does with his character designs or story structure. The humor he deploys in this opening chapter is also atypical, as rather than being cynical or inflammatory it is usually deflating, often reducing Maxx to something silly or ineffectual. Kieth never lets his hero be a badass, which also reflects the sad reality that is almost exclusively hidden behind the fantasy that we see instead. From the first issue, the collection then jumps all the way to issue #21, which one presumes was included here because it was co-written by Alan Moore. It’s a rather abrupt narrative jump in the context of this special, as the first issue ends on a cliffhanger that introduces series villain Mr. Gone and suddenly it’s twenty issues later and we’re following a new character (Sara) who wasn’t in the first issue and Maxx is nowhere to be seen. While the whiplash that this change causes makes the story a bit disorienting to read, the particular structure and voice that the legendary Moore brings to the series at least makes this issue intellectually interesting if nothing else. That compositional conundrum is furthered by the final segment, a short story done for Hero Comics in 2014. This incredibly meta chapter follows the central cast of characters of the series as they grapple with what The Maxx is really all about. On its own, it makes for a deceptively impactful piece that feels like Kieth grappling with the true nature of his most distinct creation, with wry self-commentary delivered through his characters. But there is also one line where Sara’s relationship with Mr. Gone is brushed off as “a whole other subplot” and given none of the examination that the rest of the series gets. It’s a really weird beat to find in an anthology that devotes half of its pages specifically to that subplot, and makes me wonder why the book wasn’t comprised of issues that actually relate to the elements in which Kieth seemed most interested in retrospect. 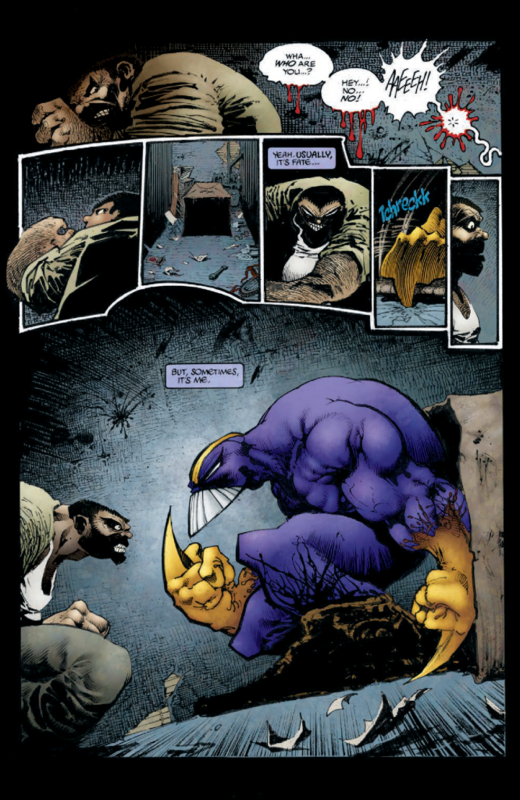 While it’s a very frustrating selection of issues for a novice like myself, one thing that The Maxx 100-Page Special has going for it is Kieth’s art, which is good from the start and gets progressively better throughout the collection. In the first three issues, the inks & finishes by Jim Sinclair and the letters by Mike & Dennis Heisler are a great complement to Kieth’s designs and layouts, and Ronda Pattison’s colors draw from the expected bold, moody palette you might expect from a 90s book. 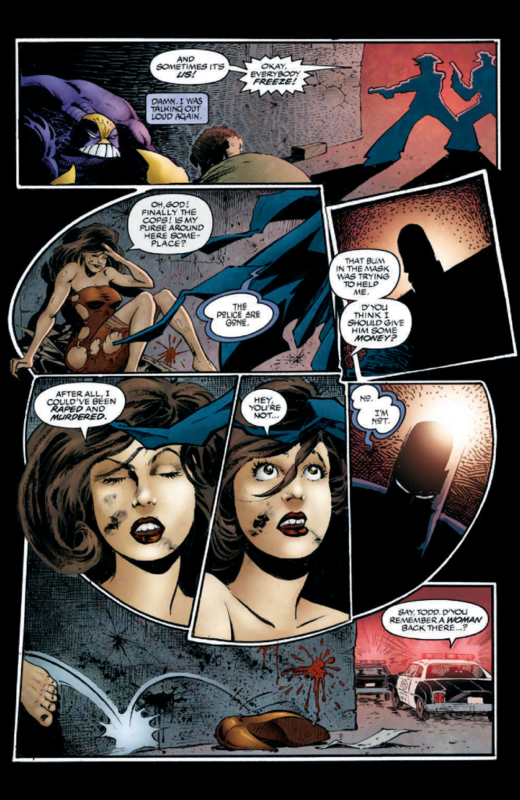 But it’s in the Hero Comics short that Kieth and Pattison really take their collaboration to another level. Kieth’s layouts are less wild than the earlier issues but his illustrations are clean and efficient, and Pattison demonstrates great range with a more subdued, watercolor aesthetic. Even new letterer Shawn Lee does more restrained work in this small chapter, befitting the more reflective vibe of the tale. 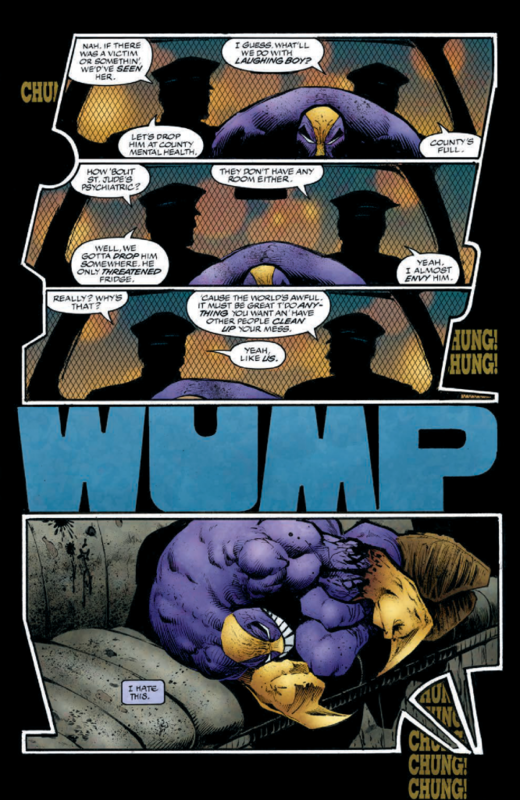 While a $5, 100-page anthology seems like a great launching pad to find new readers, I can’t fully say that The Maxx Special sticks the landing. The selection of issues doesn’t have a functional through-line (or it does, but in a self-defeating fashion) and there are too many gaps left for new readers to be able to fully grasp what the series is about as a whole. 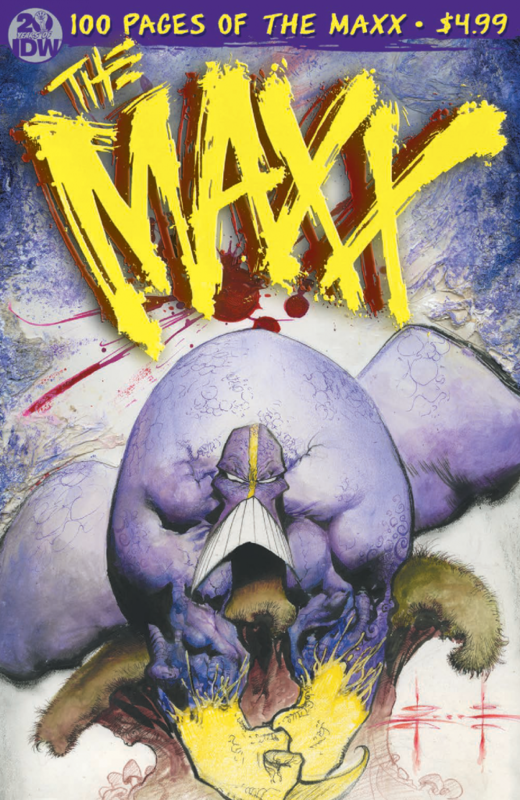 At the same time, what the book does suggest about The Maxx can’t help but pique one’s interest and encourage readers to examine the series more thoroughly. And in that light, it’s hard to deny that it isn’t at least a partial success. Written by Sam Kieth, William Messner-Loebs & Alan Moore. Additional Inks & Finishes by Jim Sinclair. Letters by Mike Heisler, Dennis Heisler & Shawn Lee. 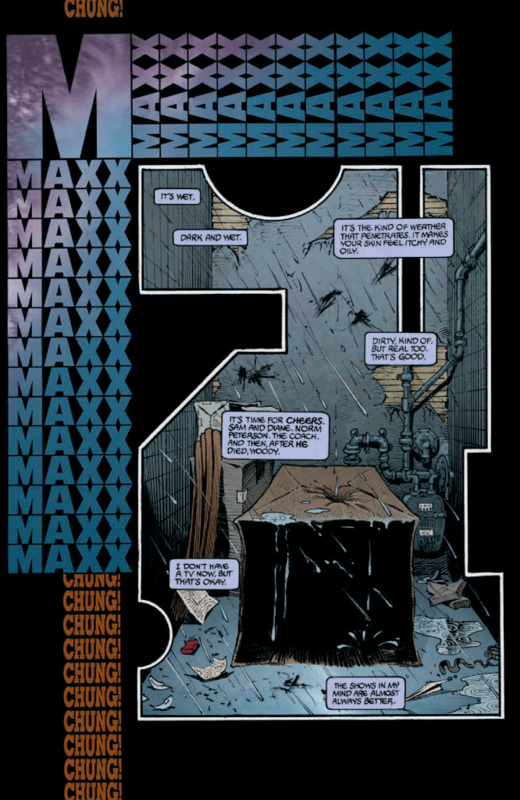 Check out this 6-page preview of ‘The Maxx’ 100-Page Special’, courtesy of IDW Publishing!